is one of those exceptions. It’s pricey, sure, but if you’re a professional or a serious seamstress/quilter, it’s 100% a worthwhile investment. I fell in love with this machine the moment I saw it, and you’ll understand why when you read through all of the robust features the 6300p has to offer. The MC 6300 is not a machine I would recommend for beginners, but if you’re a serious quilter or seamstress, you’d be hard-pressed to find another machine that’s as robust as this one in this price range. 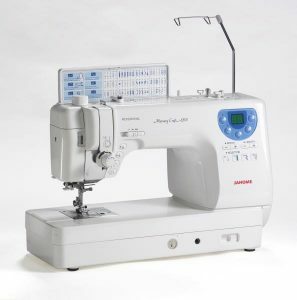 Even though it is one of our favorites, it is a huge step above the Janome HD3000 heavy duty sewing machine. For FMQ (free motion quilting), the MC 6300 is a dream, but it’s great for regular sewing projects, too. Unlike other computerized machines, this model can handle both quilting and sewing projects with ease – and precision. => Click here to learn more about the Janome MC-6300p sewing machine on Amazon. The 6300p comes with 66 built-in stitches and 4 buttonholes, which is more than you’ll ever need. Numerous decorative and quilting stitches are included, so you’re not limited to simple “up and down” stitches. And with four buttonholes, you’ll be able to tackle a variety of projects with this one machine. Selecting stitches is easy, too. Below the width and length buttons, you’ll find a panel of “stitch selector” buttons that allow you to quickly jump to the stitches you want. Other machines require you to scroll through page after page of stitches, which can be cumbersome and tedious. All of the stitches are broken down into four categories, making it quick and easy to get to the stitch you want. One of the biggest advantages to having a high-end sewing machine like the 6300 is that it comes with automatic features that make sewing a breeze. Automatic thread tension control prevents fabrics from bunching or loose stitches that jeopardize the project’s construction. There’s also an automatic bobbin winder that makes it easy to get your projects started. We also like the automatic thread cutter feature, which makes completing seams and designs effortless. There’s also a memory function attached to this feature, so the machine will remember where and when to cut the thread. Of course, there’s also a built-in automatic needle threader to help you get started quickly. Speaking of memory functions, the 6300 is capable of “learning” or remembering numerous settings, so your machine behaves just the way you want it to. 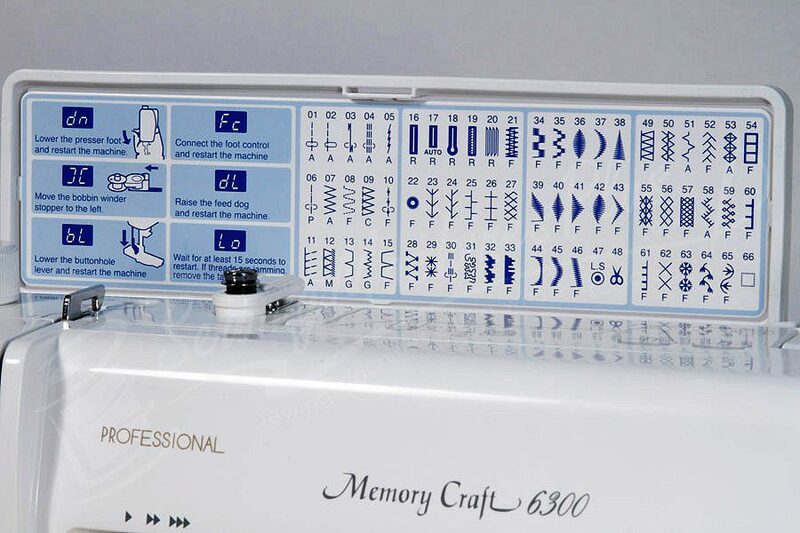 Aside from the thread cutter memory feature, you’ll also find that this machine can memorize your preferred up/down needle position. With five memory banks, the 6300 can also recall your last stitch, so you can continue where you left off seamlessly. With the touch of a button, you can adjust the length and width of stitches. You can also adjust the sewing speed to truly personalize your sewing experience. With a 5mm maximum length and 7mm maximum width, you’re sure to find just the right stitch size for your project. Adjusting the width and length couldn’t be easier. Just press the “+” or “-“ buttons under the “width” and “length” labels. The 6300 also gives you the option of customizing your stitches even further, with combination and individual stitch editing functionality. Like other high-end machines, the MC-6300p features a twin guard button. The twin guard feature automatically adjusts the width for certain stitches, and some stitches (those not suitable for twin needles) cannot be used. 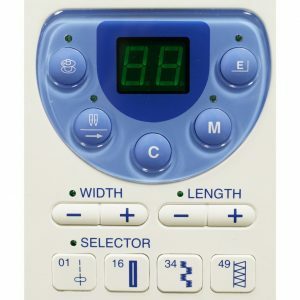 A built-in speed control slider allows you to choose your sewing speed with ease. Quilters will love that this machine comes with a knee lift, which allows you to continue sewing with both hands uninterrupted. Simply use the lift to raise and lower the needle as needed. The foot lift is extra high for added convenience, and you can adjust the pressure to your liking. There are four pressure settings: 0, 1, 2, and 3. Three is optimal for regular sewing, while 1 is ideal for fine fabrics. The LCD screen is bright and easy to read, and it also displays other important information aside from your stitch selection. The 6300p allows you to quickly and easily drop the feed dog, so you can sew buttons and do free motion quilting without worrying about damaging fabrics. Simply push the drop feed lever, located on the base of the machine, to the right to lower the feed dog. Shifting the lever to the left will raise the feed dog again. When working with certain stitches, the machine will automatically lower the feed dog for added convenience. Multiple presser feet – Satin stitch, 4 overedge feet, zipper, open toe satin stitch, blind hem, zig zag, open toe darning, automatic buttonhole, 3-way cording, sliding buttonhole, zipper, 1/4” seam, and open toe with quilting guide. Is the Janome 6300p Worth Buying? Absolutely. If you’re a serious seamstress or quilter, the Janome 6300p sewing machine will help you take your work to the next level. 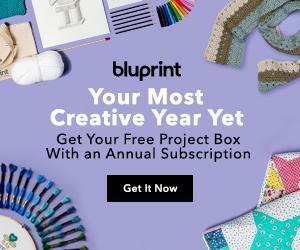 This is a professional-level machine that offers memory and customization features most standard sewing machines can’t offer. With a large working space and numerous stitches (including monogram stitches), this machine can perform double duty by acting as both a sewing and quilting machine. I’m not always a fan of computerized machines, but the 6300 is – without doubt – an exception to the rule. 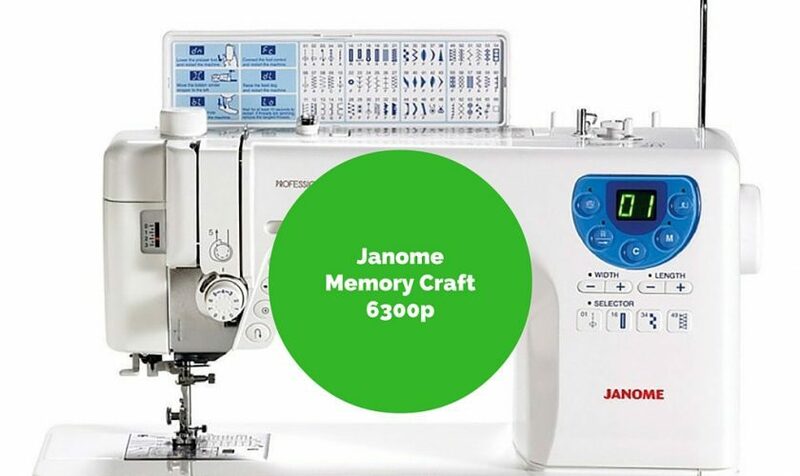 Click here to learn more about the Janome MC-6300p sewing machine.